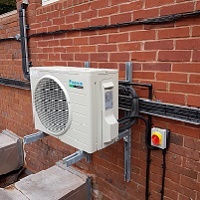 We were recently instructed by our client, Welwyn & Hatfield Council in Hertfordshire, to install a new Daikin Wall Mounted Air Conditioner in the well known Campus West Arts & Entertainment Centre. CW Entertainment provides affordable varied entertainment for the residents of Welwyn & Hatfield Borough through a 3 Screen Independent Cinema, a purpose-built Roller-Skating Rink, Soft Play Centre, Theatre and Coffee Shop & Bar that is supported by a subsidy provided by Welwyn Hatfield Borough Council. This is a much needed installation that has improved the working conditions in one of the rooms at the centre. The client was very happy with the installation which was completed on time and on budget.